Despite the cold, foggy and damp weather conditions – a very fast mix of old and young (mostly young!) runners departed the Start line at the Annapolis Naval Academy Stadium fairgrounds. And then, there was Jannett and I, waiting in the long lines at the porta potties when what sounded like a starting gun went off. Hmmm…they surely could not have started the race already? 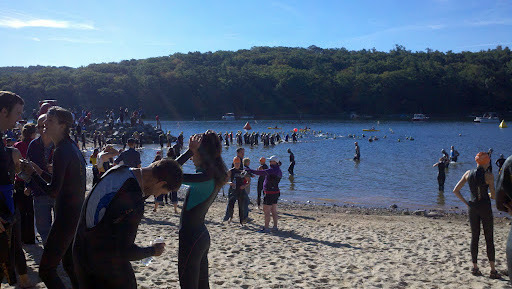 And by the time we arrived at the starting line – everyone was gone. Which probably justifies our really fast first mile pace – as we tried to catch up with the race crowds. The Annapolis Half Marathon event takes the runners through historic downtown Annapolis over cobblestone streets, continuing next to the Naval Academy, across the Severn river and up a very very long hill before the route begins the turn back toward the finish line. 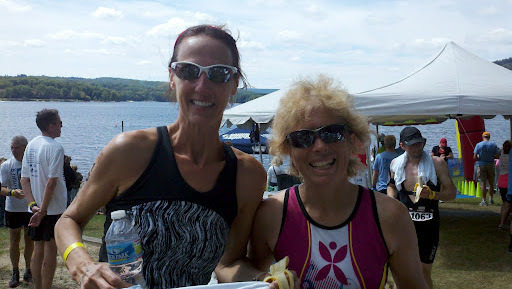 Jannett and I both finished strong, with PB’s, and no injuries!! It was a wonderful way to burn off 3000 calories, and we wasted no time treating ourselves to food and coffee! View more pics! Just days after our return from New Orleans in early February, I tore my calf muscle while running. For the last time. According to CHI Running, I have forgotten how to run like a child. And this has been going on for quite some time – if you do the math. But don’t. You get the point. The notion of just changing ONE thing at a time, is logical, and applies to making good decisions about what component of biomechanics to adjust – before adjusting something else. All well and good, unless you have a half marathon (13.1 mile) race staring you in the face – and you can no longer even walk. I experimented with barefoot shoes, minimalist shoes, 5 finger shoes until I gave myself tendonitis in my achilles. My walking speed went from a mid-12 minute mile…to 22 minutes per mile. I no longer remember the last time I went running, and yet the date for the Iron Girl Half Marathon (on April 29) crept closer. I signed up for a CHI running workshop in early March, which was intended to return my running to those carefree days as a child. Instead, my calf muscle insisted on behaving like an adult, and running or walking became a distant memory. It was time for a break from the torture, and aqua jogging became my new best friend. Every day, and some days – for hours at a time – I donned my purple floatie and plunked my pavement deprived body into the deep end of the public pool. And started jogging. Aqua jogging is the best exercise when all joints and muscles fail. And soon I would discover, this amazing hydro resistance movement was not only a great workout – it eventually saved me from complete body meltdown. But wait, I’m not done changing everything all at once. I stared at the videos of my running gait – and noted that I had become a “heel striker”. It was a dreaded label. Akin to being the last bench pick for any sport. “Oh…not her…she’s a heel striker”. Leave her on the bench. Being a heel striker, meant that I had morphed into running like an adult. Which is why my calf, achilles (and now planter facia) and I were no longer on speaking terms. For years, I had walked the walk, and run the run…as a heel striker. There is only so much a body can take. So, I enlisted the help of Coach Dave – a long time running coach in Michigan. He kindly reviewed my YouTube run mania – and astutely noted my cadence needed to be faster, and my elongated arm swing were pumping the wrong direction. I worked on these relentlessly while in the pool. The half marathon is now a month away. I wonder what pavement feels like. Meet Coach Gwen. 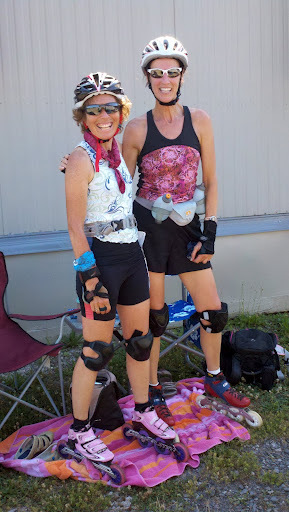 She is a local CHI running coach, and determined to return me to my childlike running form. I spent nearly 2 hours with her, walking in a large circle – in the slowest motion possible. If you really want to know how slow we walked…think of a turtle. A turtle would have passed me. I learned how to walk, without engaging my calf muscle. It was all new and exciting…but I now had 3 weeks to perfect this and transform it into running. 3 weeks til the half marathon. For the next 2 weeks, everywhere I walked…I had to think it through. I was relearning how to release my foot from the ground, and place it back down again…without ever touching the heel. Relearning how to walk is a monumental task, and can be frightening (to others) when performed in public places. Such as the grocery store. From the car, through the parking lot – to the store entrance – could easily take me 20 minutes (100 feet). Senior citizens stopped to stare. Women with small children, quickly grabbed their hands and hurried in another direction. What is wrong with that lady? But I didn’t care. I wasn’t going back to my “heel striking” days. Just over 1 week to race day, – I jogged. For the first time. It was slow, and the run was filled with adjustments (ouch – that hurt, or ooh that doesn’t hurt..let’s keep this up) but I made it 4.5 miles. And at the end, my calf muscles and achilles were NO LONGER complaining. I was riding high, and things were looking up. It is now 8 days before the half marathon – and I had just completed ONE run at 4.5 miles in the last 2+ months. But wait, let’s change one more thing. 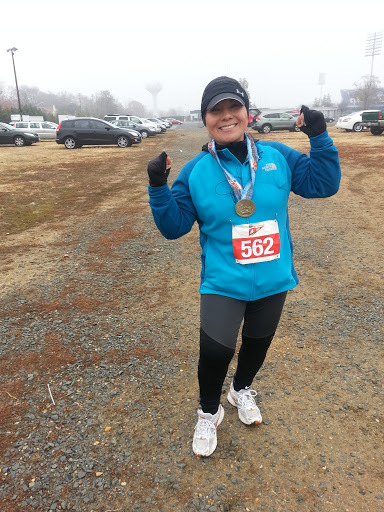 Now 7 days before for the half marathon – it rained and the temps were 40 degrees. Which meant I had a full day indoors to come up with a new plan to injure myself. I decided to really nix the “heel striker” label once and for all. You see, I would spend the day, walking around on hardwood floors ONLY on the balls of my feet (as if wearing stilettos …which is foreign to me BTW). For 12 hours…I walked ONLY on the balls of my feet, and by 10PM Sunday night – I had managed to give myself an acute flareup of metatarsalgia. Smooth move, sista groove. I can’t put any weight on my right foot. Let’s just say things are now looking grim for this half marathon. Paddy had to help me gimp my way into the aquatics center for my daily dose of aqua jogging. I had returned to heel striking – as the only way to get around. No weight at all on the ball of my foot. I started consuming Alieve, tumeric (a special brew from some remote section of Vietnam), and experiemented with 6 different insoles and foot pads to shove into my sneakers. I cut holes in the insoles at the ball of my foot to alleviate the pain. The day before the half marathon, the most I had walked was to my mailbox and back. And that was with crunched toes and pain. 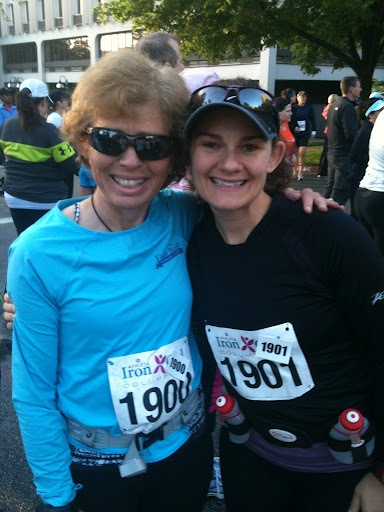 It is now race day – April 29 – and Emma and I met in the parking lot to go over the race details. We had originally planned to run this together – mother-daughter style. But there was no way I could keep up with her. Instead, I had my backup plans lined up. Paddy was on telephone standby. Who knows how far I will go. 100 yards? 1 mile? It may take me the day (or 2) to complete 13.1 miles – so everyone keep your phones charged. I gimped my way to the starting line, and Emma seemed worried about leaving me alone on the race. I insisted that she run by herself, and call me when she reaches mile 12. This way, we can figure out a rendezvous point. I may not even make it to the first mile. The race started, and I stayed in the back of the pack. Along with my new peeps and comrades. I stepped gingerly over the starting line, and began a shuffle back-n-forth mid foot to mid foot, as the first steps were all about pain avoidance. It appears that I can shuffle along with the back-of-the-packers, as long as I keep my toes scrunched to prevent any impact to the ball of my right foot. I listened to random chatter, ranging from some lady who had dropped 400 pounds and was constantly injured, to another who is inflicted with chronic bronchitis. My foot pain seemed inconsequential to all of that. I had reached the mile 1 marker, and was still shuffling along. Amazing – considering the longest distance in the past week was to my mailbox and back. Some of the peeps-in-the-pack had started walking. I kept the slow-mo shuffle going until somewhere between mile 2 and 3. At that point, my quads started aching – probably due to this bizarre toe scrunching shuffle that I was performing. 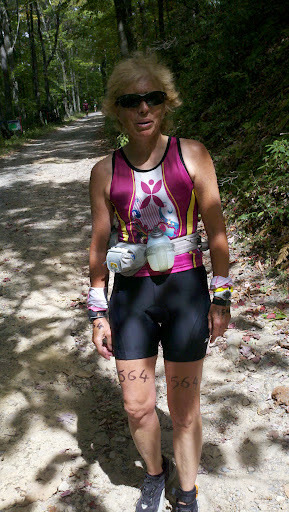 I knew if my quads where aching now, I had to make an adjustment or my time on the race course would soon be over. So I started leaning forward…just a little…the CHI thing…the childlike runner. It seemed that when I leaned forward, I went faster. 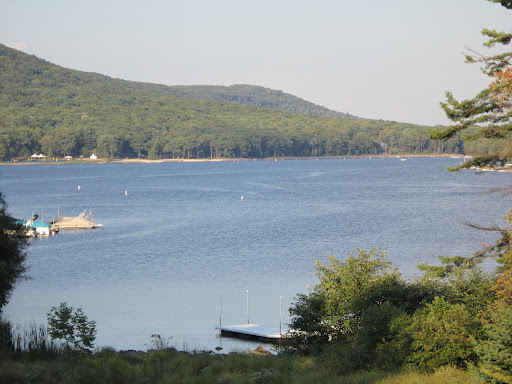 Now fast was never a thought that crossed my mind, as I’m still consumed with pain management – but the notion of going faster AND not activating new pain was workin’. Around mile 3, the most bizarre thing happened. I started passing people. I was leaning and passing. My toes were still scrunched up, and I was avoiding ball of foot contact…but maybe…just maybe I could actually DO the 13.1 miles. It is now mile 6, and I have not changed a thing since mile 3. I didn’t dare. It was working, and I was approaching the 1 steep hill at the halfway point. Everyone was walking. Everyone but me. 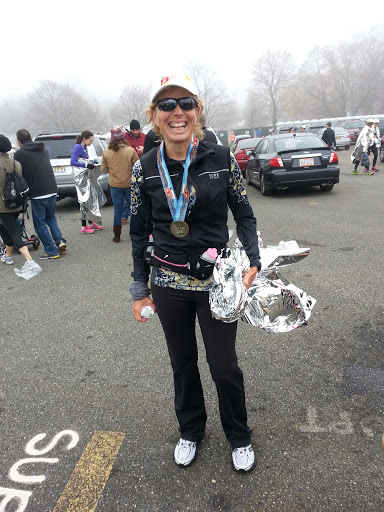 I couldn’t stop, I couldn’t walk…I had to keep the running gait I had discovered back at mile 3 – or risk never finding the fine line between pain management and finishing. 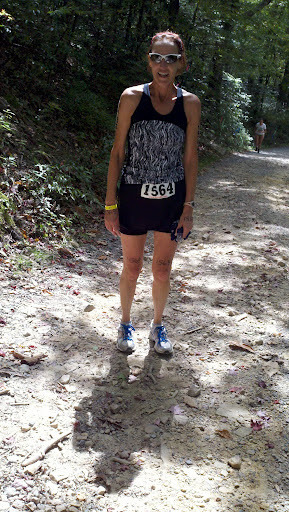 I ran up that hill, and knew at this point, that I would make it to the finish line. I ran past every water station, and I even ran past mile 8. Mile 8 is where the volunteers were handing out chocolate. That was hard, but I kept running. Another hill at mile 10, where many were walking. Not me. I had become Forrest Gump and there was no stopping til I reached the finish line.